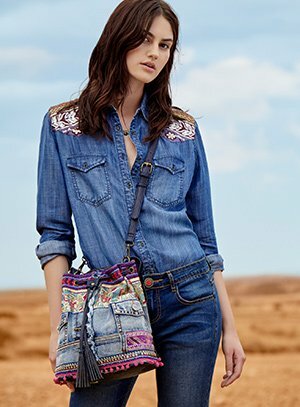 Total denim looks are a must this season. Let our guide inspire you to create your own combinations. Soft and light with details you won’t find anywhere else. You know what they always go great with? More denim! 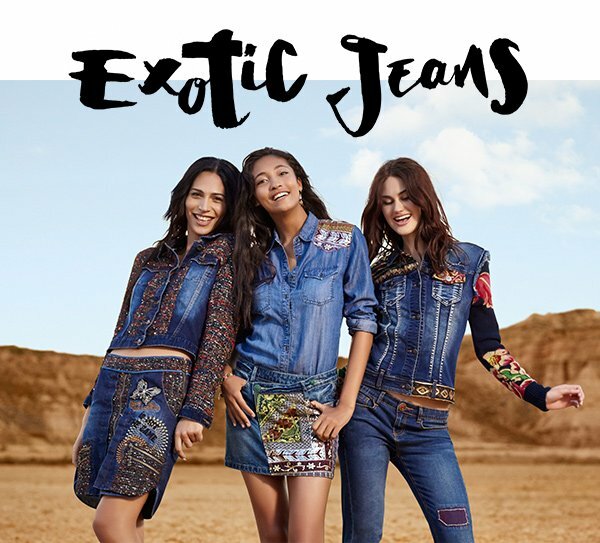 With so many different fits this season, you can be sure at least one of our Exotic Jeans will have your name on it. Now with more sizes, designs and very special exotic details. Discover them all! 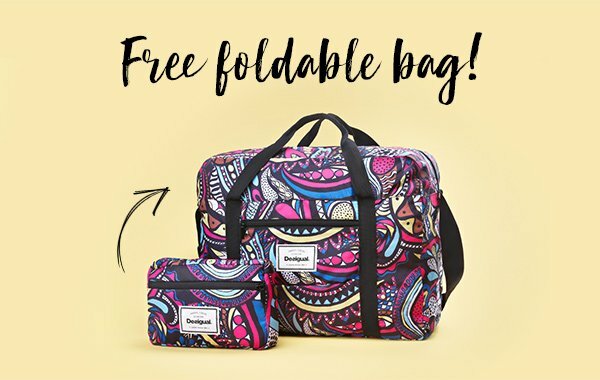 Take home this bag as a gift! Get this original and unique foldable shopping bag with purchases over $149. Limited time! If you no longer wish to receive your copy of the desigual newsletter, click here. 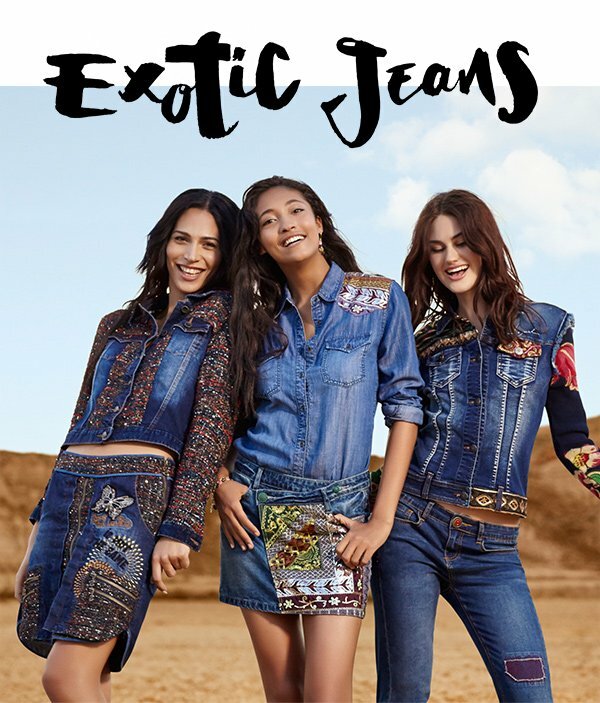 * Promotion valid valid at Desigual stores (except Outlets) and at desigual.com from 09/22/2016 to 10/02/2016. Valid promotion with the mínimum purchase of $149 in articles from the Autumn / Winter 2016 Collection. Cannot be used in conjunction with other offers or promotions including those from the Amig@ Card. In compliance with Organic Law 15/1999, dated December 13 and concerning the Protection of Data of a Personal Nature, and Royal Decree 1720/2007, dated December 21 (Spain), approving the regulations deriving from said Law, you do hereby authorise the inclusion of the data of a personal nature shown in the fields above in a file owned by ABASIC, S.L.U, to be treated as confidential and used for the purposes of advertising, promotion and information regarding the products, services and activities of Desigual, all relating to the sale and marketing of garments and accessories, and to be able to maintain our commercial relationship with you. At all events you may exercise your right to request access, rectification or cancellation of said data or to oppose the processing thereof by applying in writing to Passeig Mare Nostrum, 15 - 08039 Barcelona (Spain), telephone 1-855-3745-872 or by e-mail to help_en_us@help.desigual.com. Unless you state otherwise, within a period of thirty days it will be understood that you have given your consent to the processing of your data which, at all events, you may revoke at any time. Likewise, you authorise the use of your data by any of the Desigual Group Companies for the aforementioned purposes. Ti sei dimenticata qualcosa nella borsa... Non fartelo sfuggire! -still don’t have our APP?